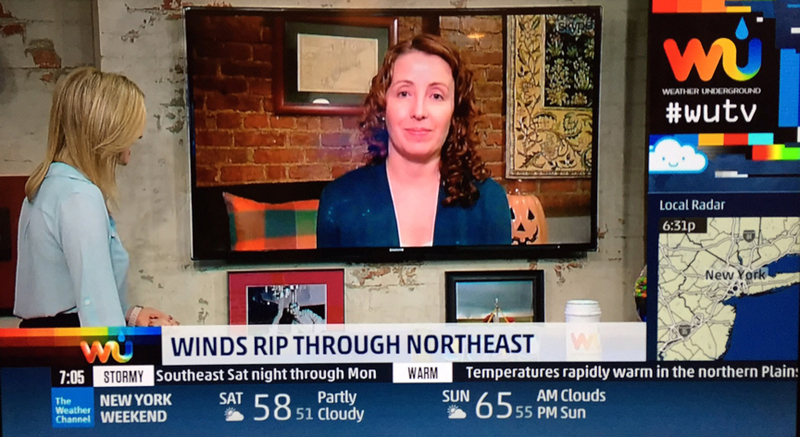 On Thursday, I was asked to appear on the Weather Channel’s new show, Weather Underground TV (WUTV). As a personal weather station owner, we discussed the recent dramatic temperature fluctuations in the northeast, thoughts about the upcoming winter season, and even touched on climate. It went very quickly, but it was a great experience! The show, co-hosted by Mike Bettes and Sarah Dillingham, covers breaking weather news, but also dives into the science behind the weather and the challenges of forecasting. With a bevy of experts from both the Weather Channel and Weather Underground on tap to discuss the topics of the day, the two-hour program is always interesting. Simply put, it is must see TV for anyone interested in the “why’s” and “’how’s” of weather. Bouncing between the extremes of drought and flood, the weather whiplash in Texas continued this weekend. For the second time this year, torrential rain caused widespread flooding across the Lone Star State. The city of Corsicana, south of Dallas, saw more than 18 inches of rain between Friday and Saturday. 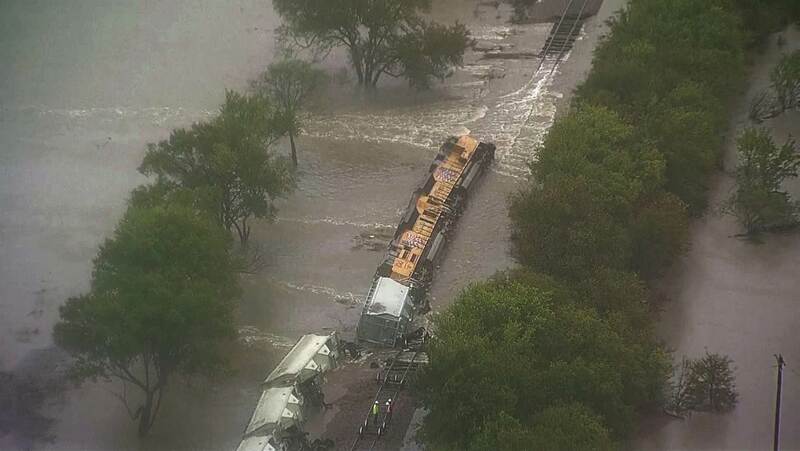 Flash floods caused extensive damage and even derailed a Union Pacific freight train. In Houston, where they received 8 inches of rain on Saturday and Sunday, bayous swelled out of their banks and flooded roadways. Local officials say Buffalo Bayou near the downtown area rose 20 feet in just 12 hours. The cause of this prolonged rain event involved the interaction of a few key atmospheric players. First, an area of high pressure over the east coast – with a clockwise circulation – pushed tropical moisture across the Gulf of Mexico and into Texas. Then, there was a strong upper level low – with a counter clockwise circulation – over the southwest and a cold front moving southeast. These added lift to the atmosphere. When the warm saturated air was forced to rise, it cooled. Since cool air holds less moisture than warm air, the moisture was wrung out of the atmosphere in the form of intense rain. Then, on the heels of all that, remnants of Hurricane Patricia from the Pacific Ocean traveled across Mexico and into Texas. It brought even more tropical moisture into the mix. Ironically, much of Texas was in a drought just last week. 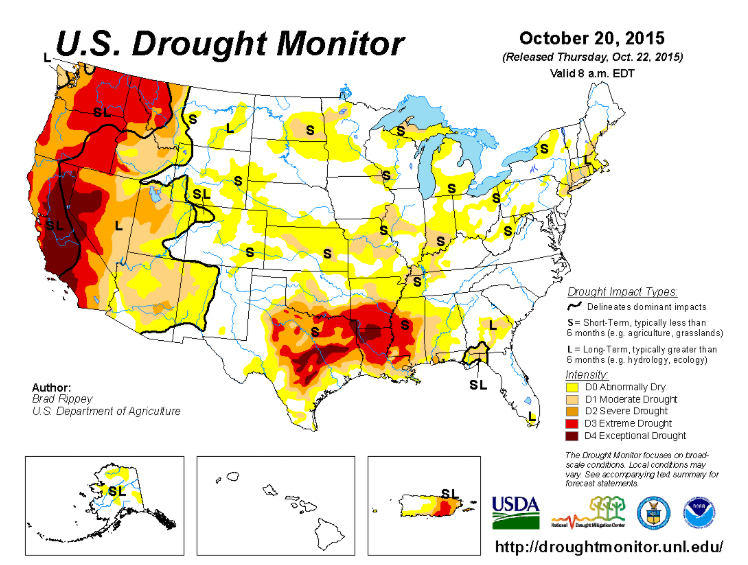 It was considered a “flash drought” as it developed very quickly this summer after intense rains and catastrophic flooding in May brought the previous drought to an abrupt end. From drought to flood to drought and back to flood, Texas certainly has had a wild ride with weather this year. Our global temperature continued its upward trend last month with September 2015 marking the warmest September ever recorded for the entire planet. According to a report by NOAA’s National Centers for Environmental Information, Earth’s combined average temperature for the month – over both land and sea surfaces – was 60.62°F, which is 1.62°F above the 20th century average. It surpassed the previous record set just last year by 0.19°F and marked the highest departure from average for any month on record. September was also the fifth consecutive month this year to break a monthly temperature record. While heat dominated most of the planet last month, some places were particularly warm, including most of North America. Here in the contiguous United States, it was our second warmest September on record. With a monthly temperature of 68.5°F, which is 3.7°F above the long-term norm, only September 1998 was warmer. In fact, most of the lower forty-eight states experienced exceptionally warm conditions and nine – Connecticut, Colorado, Maine, Michigan, Minnesota, New Mexico, Rhode Island, Utah, and Wisconsin – were record warm. Year to date, the first nine months of 2015 were the warmest of any year on record. That puts 2015 well on track to becoming Earth’s warmest year ever recorded. Global temperature records date back to 1880. Powerful, but slow moving, thunderstorms brought heavy rain to the mountainous region of northern Los Angeles County, California on Thursday afternoon. With the soil hardened from years of drought, the water ran off downhill and unleashed flashfloods and mudslides across the area. 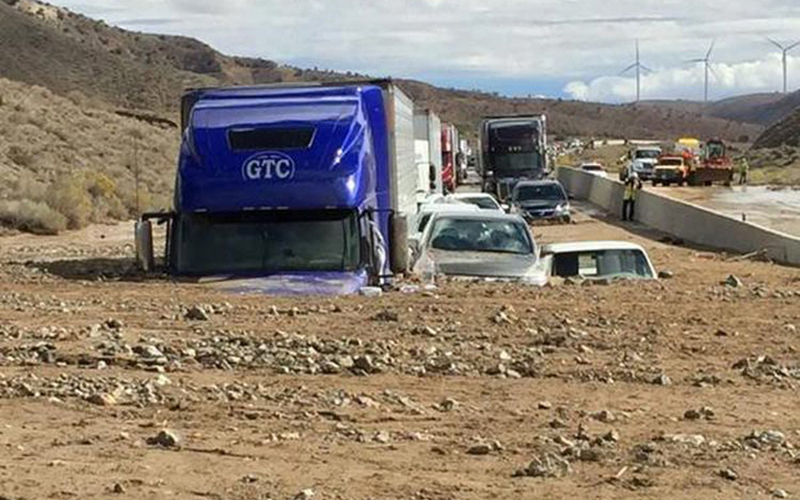 Local officials say the mud – up to 5 feet deep in some spots – trapped hundreds of motorists in their vehicles on Interstate-5 and Route 58. Homes in the Elizabeth Lake area were also surrounded by mud and debris flows. Luckily, no fatalities have been reported. According to the NWS, Antelope Valley, which sits between I-5 and Rt. 58, received 1.81 inches of rain in 30 minutes. They have described that as a “1,000 year rain event”, which means there is a 1-in-1,000 (0.1%) chance of this type of event happening in any given year. It is interesting to note that this is the second “1,000 year rain event” to happen in the US this month. The other was the historic flooding in South Carolina. The intensity of this California deluge had two main drivers. The first was a cut-off low-pressure system over the area that provided lift. The second involved the warmer than normal sea surface temperatures in the Pacific Ocean, which allow for increased amounts of evaporation and higher levels of humidity. Combined, these two factors were able to generate enough instability in the atmosphere to produce heavy thunderstorms. While experts say this storm was not related to El Niño, it does offer a glimpse of what may be in store for the Southwest over the next few months. The impacts of El Niño are typically strongest during the winter season. Today, I will be giving a presentation that I developed called The Art and Science of Climate Change at the New York Photo Salon. Blending my two worlds, it introduces the basic science of climate change and explores how artists from around the globe are reacting to its various impacts and possible solutions. If you are in the area, please stop in and say hello. The program begins at 6:30 PM. 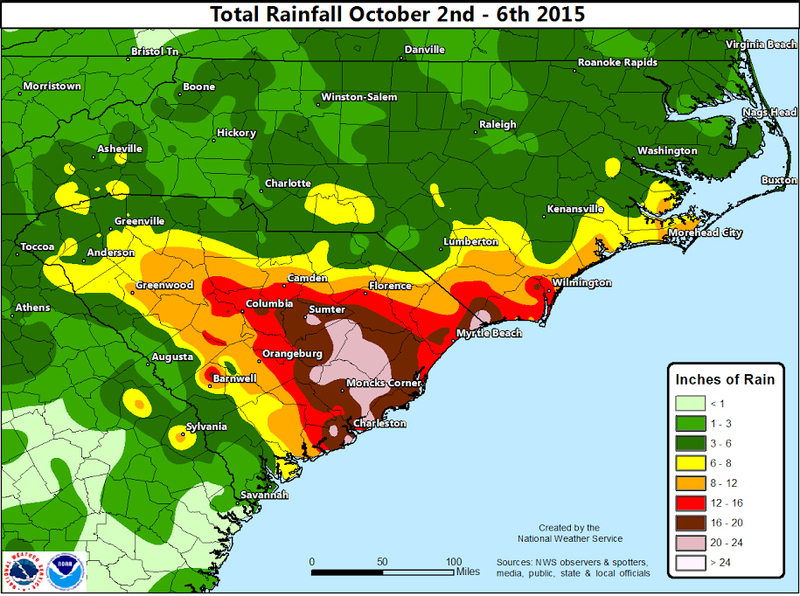 Relentless rain unleashed catastrophic flooding across South Carolina this past weekend. 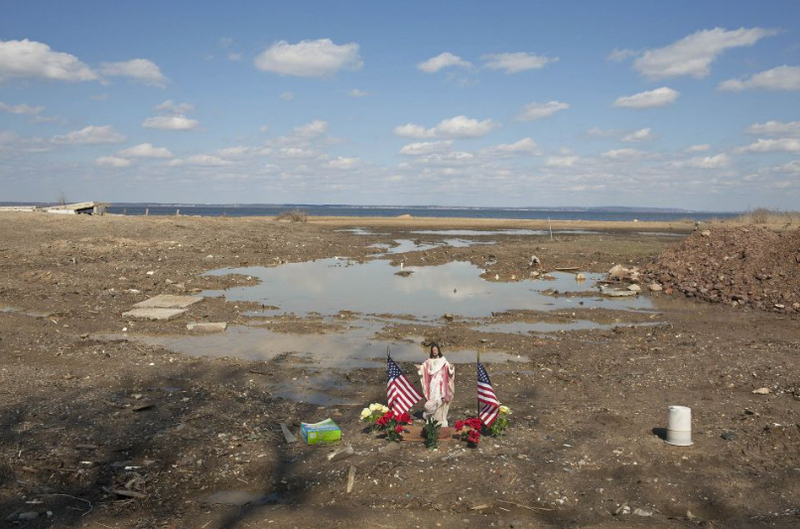 Officials say it was one of the worst disasters in the state’s history. According to the NWS, an estimated 5.8 trillion gallons of water fell in the Palmetto state in just four days with some communities receiving more than 20 inches of rain. This storm total exceeds that of any tropical cyclone on record that has impacted South Carolina. Receiving this massive amount of precipitation in such a short period of time overwhelmed rivers and streams, and even caused a number of dams to breach. The floodwaters inundated homes, businesses, and shut down major roadways, including parts of Interstate-95. Local officials say the storm also caused water mains to break, leaving more than 40,000 people without drinkable water. To date, seventeen weather-related deaths have been reported across the state. This type of rainfall is considered a one in thousand year event in South Carolina. That does not mean it can only happen once every thousand years. It refers to the recurrence interval – a statistical calculation that means an event has a one in one thousand chance (0.1%) of happening in any given year in a given location. The cause of this widespread and destructive flooding was the unique convergence of three different weather systems that essentially set up an atmospheric river – a fire hose of moisture – aimed directly at South Carolina. The first was Hurricane Joaquin, which sat over the Bahamas for days and pumped huge amounts of moisture into the atmosphere. The second was an upper level low-pressure area over the southeastern US and Gulf of Mexico. It helped pull some of Joaquin’s moisture westward toward the US coastline. And lastly, there was a stalled frontal boundary along the coast. When the warm saturated air encountered the cooler air along the front, it was forced to rise and cool. Since cool air holds less moisture than warm air, the moisture was wrung out of the atmosphere in the form of intense rain over the same area for days. Although the rain has now cleared, South Carolina is not out of the woods just yet. As swollen rivers make their way to the Atlantic, more flooding is expected in the state’s coastal low country. 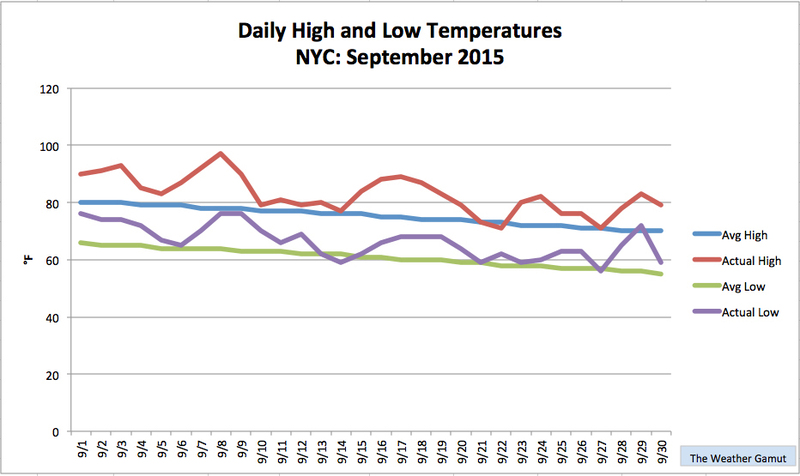 Summer-like weather extended well into September in New York City this year. With an average temperature of 74.6°F, it was the city’s warmest September on record! It surpassed the previous record set in 1961 by 1.1°F. Overall, we had twenty-seven out of thirty days with high temperatures above average. Six of those days posted readings in the 90s, including September 8th when the mercury soared to 97°F in Central Park, marking a new record high for the date. Typically, we only see one 90-degree day during September in NYC. Historically, our average temperature for the month is 68°F. This extended period of warmth was produced by a persistent ridge in the jet stream over the eastern US. It allowed warm air from the south to flow further north than it normally would at this time of year. 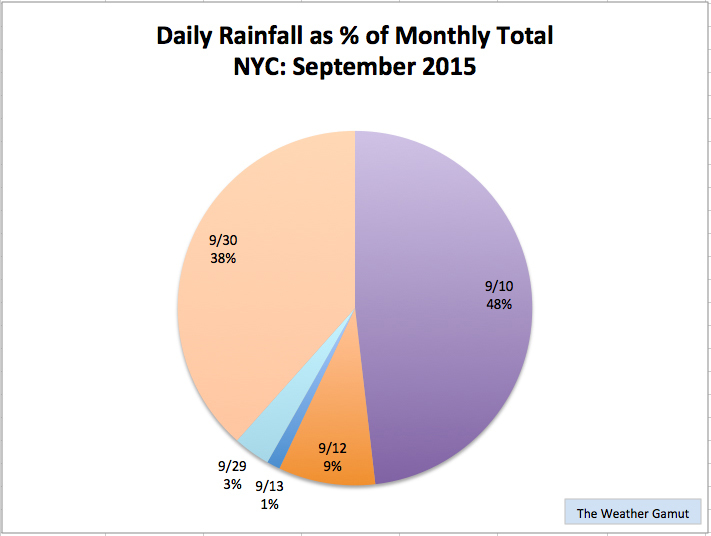 In terms of precipitation, September was unusually dry and marked the third consecutive month that NYC received below average rainfall. In all, we received 3.28 inches of rain, which is one inch below normal. The vast majority of this modest total fell on two separate days in the form of intense downpours. In fact, September 10th set a new daily rainfall record with 1.58 inches measured in Central Park. Nonetheless, despite these soakers, NYC remains in a moderate drought according the latest report (9/29) from the US Drought Monitor.